For their 25th anniversary in operation, book publisher TASCHEN put out 150 special editions of mostly art-based books spread across a wide array of periods and genres. There’s a book on artwork from ancient Egypt, others collecting the works of traditional favorites (Matisse, Van Gogh, Monet). There are books on modern artists (Escher, Pollock), books on beautiful destinations, and books on artistic movements (Surrealism, Abstract Expressionism, Dadaism). There are several books on the great photographers, and a few more on iconic subjects (Steve McQueen, the Eiffel Tower). There are also books on unusual, if beautiful compendiums of singular subjects (roses, chairs, signs, record covers, tattoos). 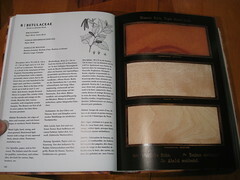 In this last category, and as the last entry on the second-to-last page of TASCHEN’s list of 25th Anniversary offerings hides THE WOODBOOK. 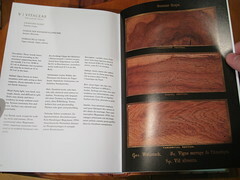 Published in 2007 – 2 years after TASCHEN’s actual 25th birthday – The Woodbook is a recompilation of the life work of one Romeyn Beck Hough (1857-1924) who between the years 1888 and 1913 published ”American Woods,” a 15 volume set, each with 25 species of wood (so 375 species in all) wherein each species was displayed on black cardstock as 3 2”x5” sections of actual wood cut and labeled from the three main cut directions: transverse (crosscut), radial (quartersawn), tangential (flat or plain sawn). 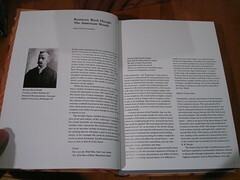 After Hough’s death, a posthumous publication was made without the 15th volume (350 species in all) in 1928. This book – my book – is of course a reproduction, and includes 354 species and varieties. There are no real wood samples. It is simply a beautiful, hardcover book with actual-size color print reproductions on its pages of R.B. Hough’s original plates. 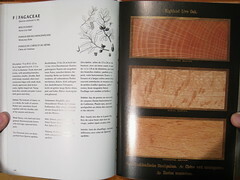 The “original plates,” which of course were completely unique to each instance published, as they were made of real wood from real trees, are in this case reproduced from perhaps one of the best-preserved examples at the Royal Botanic Gardens Kew, London, photographed by Kew’s photographer, Andrew McRobb. 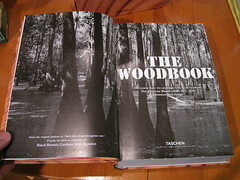 The book starts with an 8-page section on Hough and his American Woods, and was written by Klaus Ulrich Leistikow. It delves lightly into the history of wood use and exploitation in the late 1800s, and the events that lead up to R.B. Hough’s creation of his work, including mention of the veneer machines of the time, and the scarcity of information on Hough and others related to the collection and creation of the plates. Ulrich, who was responsible for the bulk of the work behind this recompiling and updating of Hough’s efforts did not live to see them published. 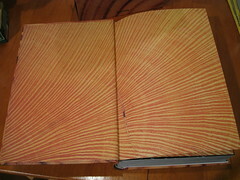 He died in 2002, just as the first (and only other) edition of The Woodbook was published. I found online a set of 5 of 14 original volumes of R.B. Hough’s American Woods, and they’re going for $12,500 through the Antiquarian Booksellers’ Association of America! That’s $2500 per volume, and at that rate, the full set of 14 would set you back $35,000. So yeah… mine’s not an original. Also of interest, I uncovered a few images of what appear to be original volumes of Hough’s American Woods. 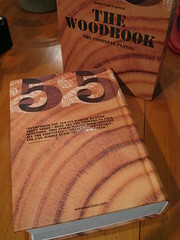 Something important to note about The Woodbook is that it is written at once in 3 languages, so the 8 page bit on R.B. Hough repeats 2 more times, once in German, and once in French. The information on each species is brief and includes the current common and scientific names (original, often outdated names are on the plates themselves), and a ‘portrait,’ a description of the tree divided into 4 sections: Description, Habitat, Wood, and Use. The “description” of each is a small paragraph stating height, general form or growth information, and anything in particular to a tree, such as furry leaves, information about fruit and flowers if any, bark type, and so on. “Habitat” lists a few sentences on locations and tolerances to weather/soil types. The bit on “wood” – which we all care about – might say something like “Heavy, unusually hard, strong, silky-sheened, and close-grained; polishable,” in the case of the Dogwood family, while another might simply say a particular species is best as firewood as it doesn’t grow large enough to use in the making anything. 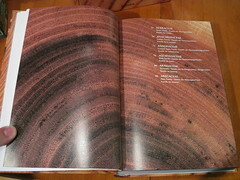 In the end, I love having this book in my growing woodworking/dendrology library. I’m planning to make a shelf somewhere just to house books on this subject, so they don’t get lost among all my other interests on the bookshelf. They’re that important to me :) However, if you’re not convinced, or can’t spare the cash, the full collection of plates (not text) is on display online, thanks to the North Carolina State University. 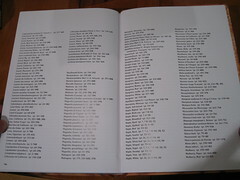 They also have the collection indexed by common and scientific names. NCSU hosts the photos of many works in their forestry collections online. They’re fun to look through. 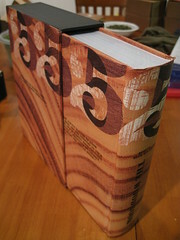 The Woodbook’s index, shown above, lists common and scientific names, the pages they’re found on in the book, and in parentheses, their original plate number from the American Woods volumes. 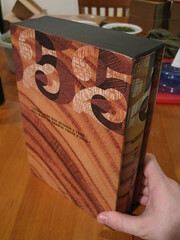 The numbers at the top of the book and its attractive dust sleeve box are layered 2s and 5s. I finally realized it was an artsy version of “25,” as is found in some way on all of the covers of the “TASCHEN 25” 25th anniversary lineup. In conclusion, I love having this big, heavy, physical book, just as I love having R. Bruce Hoadley’s similarly large books on wood identification and understanding. They feel like good, heavy tools. They’re attractive, and full of great information. 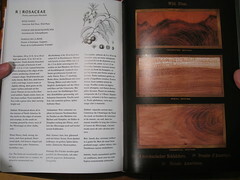 The Woodbook in particular gives me a real sense of what an epic journey knowing our planet’s woods really is, as after 100 years or so, this still only ends up featuring 350+ of the world’s hundred thousand or more species, and really mostly those of North America, and not even all of the ones people know and regularly use. You could write a book thicker than this on any given species, but each species gets but a blurb in here. Obviously, we don’t have time in our lives to read a huge book on every species, nor probably do we care enough to read a huge tome on any particular species, but that’s my point. R.B. Hough spent much of his adult life cataloging and publishing this work, which is a real masterpiece when held up against any other spread I’ve seen yet of what’s inside the world’s woods, and yet it’s just a faint scraping at the edge of what there is to know. It’s kind of exciting to know that there’s something that vast out there, and to know that as long as I live, I never need to suffer boredom. I’ll never get through all of it, and this is just trees. There are also plants, and animals, and galaxies :) These are the kinds of thoughts I think, holding a life’s work like this heavily in my hands, and that’s in part why I so appreciate it. In the end, it is a photo journal of one man’s journey to uncover and known what’s out there. i bought that book about a year ago… i cant say i bought it to use as research or to really read cover to cover! I’m definitely in the minority. I love looking at lumber pictures, but this book didn’t really do it for me. I definitely was disappointed to see how much space was devoted to multiple translations. the photos are nice, but I think this really puts it into perspective how lucky we are to have the free website over at hobbit house. I’d have given this 3.5 stars if it were my choice. Glad others are loving it so much though. I don’t know, Hokie. I may feel the same way eventually. I could be in the honeymoon phase. I’m sure part of it is that it’s putting me in touch with researchers of the past, but I really can’t disagree with your points. And I love hobbit house! My wonderful wife gave this book to me as a Christmas gift. It’s been wonderful. She and I take walks through the local parks and we both laugh about my inability to identify the trees, many of which I include in my hardwood projects! I can identify the common Birch, Oak and Maple. Beyond that, I go to the book! i should add that it is pretty rare to see radial views of lumber. If you’ve already got a few other wood books, this would probably also offer something different. the entire quality of the book seems to be top notch (from paper quality, to the photos, to the binding, etc.). this book has helped me id countless trees from my area.it is one the best christmas gifts i have ever received. I’ve seen this book at the Half-Priced Bookstores here in town, debated on getting it myself. I think it was like $30-$40, cant recall for sure.